The SSS-6-P plain spouts are similar in style to the prototypes seen in most of the TetherSpout Chronicles (photo albums) and are excellent for all-round versatility and convenience. They have a sturdy 1 mm wall thickness and a 4 mm round inside bore that will take a standard electrical banana plug, and have lateral 3.5 mm diameter cross holes at the outer end to accept a ring, hook or clasp. Their ends are also slightly tapered to make them easy to thread thru retainers and to prevent the spout from jamming when pulled thru a retainer with the aid of a pull string. 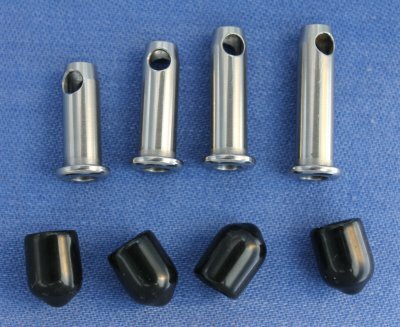 The SSS-6-P spouts come in four different lengths that can be purchased individually or as a set. You can save a little money by purchasing the full set and it is highly recommended that you do so because you will find that your needs (to achieve a perfect fit) often vary, depending on what is attached. On many men, for example, the 18 mm spout may deceptively look like it is too short to be of much use, but you will be surprised by how often you want a spout that ends deep inside your orifice, staying invisible and making attachments like hooks or rings look like mysterious internal connections or unusual body piercings never seen before. On the other hand, you will need a longer spout if you intend to attach a rubber hose, or if you want it to protrude slightly so that your urine stream is always consistently predictable, smooth and accurate. The last two numerals in the SKU or stock number indicate the overall length in millimeters. For extended wear when nothing is attached, every spout comes with a soft little vinyl cap that will avoid irritation when the spout is pushed in deep and hidden, and that will prevent lint and other contaminants from getting into your urethra if the spout protrudes. With a retainer that seals, it can also neatly prevent unwanted leakage or messy drips. BTW: Your urine stream will remain laminar and intact and will not shoot out of the side holes if the spout protrudes, as long as nothing blocks the opening.